Although narrowing Morocco's plethora of incredible destinations down to a top 10 list is difficult, no trip to the North African nation would be complete without a visit to at least one of its four imperial cities. In particular, Marrakesh, Fez and Meknes are packed full of colorful bazaars, breathtaking palaces and bustling town squares. Morocco is also famous for its natural beauty, from the golden beaches of seaside towns like Essaouira and Asilah to the magnificent arid landscapes of the Sahara Desert. Here, the possibilities for adventure are endless. Sign up for a camel-back trek through the Sahara, climb North Africa's highest peak or head to Dades Valley for a few nights in a traditional ​kasbah. This article was updated and re-written in part by Jessica Macdonald on October 31st 2018. Medieval Fez served as Morocco's capital for more than 400 years and is still an important religious and cultural center. The old walled part of the city, known as Fes el-Bali, was founded in the 9th century and is recognized by UNESCO for the historical importance of its Idrisid dynasty architecture. It is best explored on foot and includes the Quaraouiyine mosque and its associated university, which is the oldest in the world. Other highlights include the Chaouwara Tanneries, the Merenid Tombs and the Mellah or Jewish Quarter. Situated on Morocco's Atlantic coast, Essaouira is a great place to get away from the heat and bustle of the bigger cities. In the 1960s, the seaside town was a popular hangout for icons like Jimi Hendrix and Bob Marley. The beach itself is a well-known kitesurfing hotspot, while the town charms with narrow streets, red-and-blue-painted houses and ramparts that overlook the busy harbor. Essaouira is known for its quality seafood restaurants and hosts the three-day Gnaoua World Music Festival in June. Nestled amidst the scenic peaks of the Rif Mountains, Chefchaouen is a small town in a big landscape. It is a center for creativity, attracting painters and photographers with its clear light, serene blue-painted houses (and its reputation as the cannabis capital of Morocco). Browse local arts and crafts in the quaint shops of the medina, enjoy a drink amidst the architecture of Uta el-Hammam square or sample fine Moroccan cuisine at a riad restaurant. The surrounding countryside is full of beautiful hiking trails. 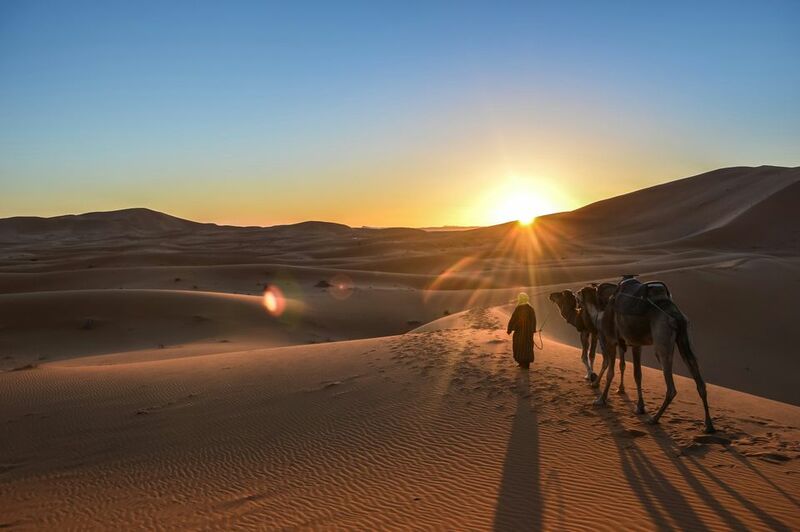 Located on the edge of the Erg Chebbi dune sea, the small town of Merzouga acts as a gateway to the dramatic wilderness of the Sahara Desert. Many operators offer camel safaris, which last anywhere from a few hours to several days. This is the most authentic way to explore the Saharan landscape of knife-edged dunes, blazing blue skies and rare desert wildlife. Most include a visit to a traditional Bedouin camp. Adrenalin junkies can also sign up for quad bike tours, sand-boarding and sand-skiing. Jebel Toubkal, situated in the High Atlas Mountains, is the highest peak in North Africa. At 13,667 feet/4,167 meters, the trek to the snow-dusted summit is no easy feat but the breathtaking scenery makes the effort worthwhile. While you can make it to the summit and back to the town of Imlil in a day, it's a good idea to allow at least three days. This way, you have enough time to acclimatize to the effects of altitude. ​The mountain is also just 80 kilometers from Ouikaimeden, one of the only ski resorts in Africa. Meknes is smaller and more laid-back than Marrakesh and Fez yet it has all the charms you'd expect of an imperial city including a well-preserved medina filled with easily navigable souks. Meknes was the capital during the rule of 17th-century Sultan Moulay Ismail and is a showcase of Moroccan architecture complete with huge gates and impressive carvings. History buffs will love top attractions like the Royal Stables and the Museum of Moroccan Art, while the Roman ruins at nearby Volubilis are well worth a visit. The Dades Valley runs between the Jebel Sarhro and High Atlas mountain ranges and offers some of Morocco's most spectacular scenery. Its cliffs transition from ocher to rose to deep red with the changing light and in some places tower 1,000 feet above the verdant oases of the valley floor. The best way to appreciate the valley and its Berber villages is on foot, especially when you reach the magnificent Todra Gorge. Traditional forts or kasbahs can be found at regular intervals and many now double as luxury hotels. Tangier is the gateway to Africa for those traveling by sea from southern Europe. While the city doesn't have quite the charm it did in the 1940s and 1950s when you could rub shoulders with the likes of Truman Capote and Tennessee Williams, there's still a lot to see. Highlights include the medina, the Kasbah Museum and the French-inspired Ville Nouvelle. The harbor also offers interesting views of the Strait of Gibraltar and distant Spain, while a short drive away from the city center reveals some pretty beaches. Situated on Morocco's North Atlantic coast, seaside Asilah is very popular with Moroccan vacationers who flock to its sandy beaches during the hot summer months. The city walls are covered in colorful murals and the houses are painted white, evoking the white-washed towns of the Greek Islands. Every August, artists, musicians and street performers converge in Asilah for the town's vibrant annual Arts Festival. Parts of the medina date back to the 8th century, while the impressive ramparts are a relic of Portuguese colonial rule.